Could tiny predators help banish barnacles? As long as sailors have been going down to the sea in ships, they have been coming back with their ships’ hulls coated with barnacles, algae, and slimy gunk. And for just as long, mariners have searched for ways to repel and remove the adhesive organisms. Solutions ranged from scraping the hulls with heavy chains to more wacky approaches such as electrifying the water around vessels, coating the hulls with glass, and turning entire ships into magnets. 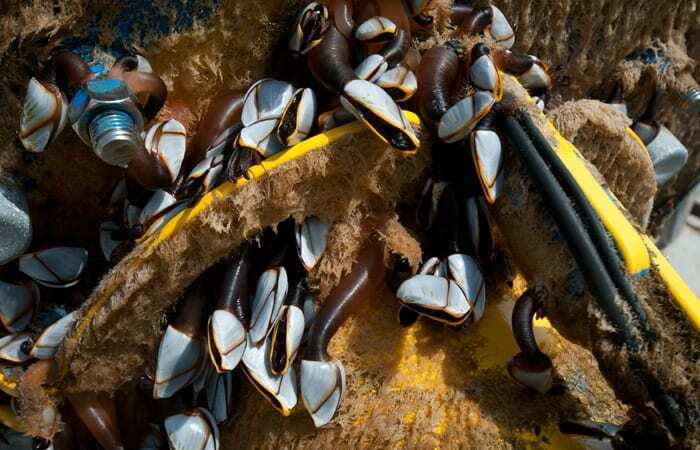 Yet “biofouling,” as it is called, continues to plague ocean-going vessels. It’s also very, very expensive. 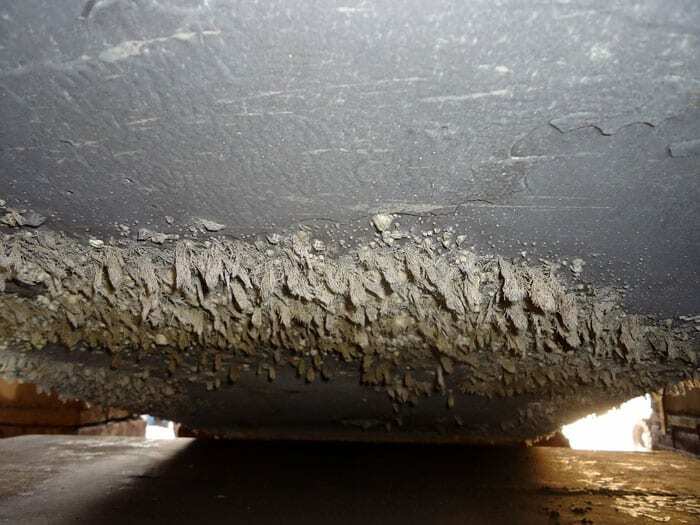 A 2011 study estimated that biofouling increases the frictional drag on ships so much that it costs the U.S. Navy between $180 and $260 million per year in added fuel use. Then there’s the cost of taking each ship out of service for a few weeks and putting it into dry dock so the hangers-on can be scraped off or dislodged with high-pressure jets of water; and the cost of preventive measures that enable ships to get by with a scraping only every two years, rather than every few months. Add in other nations’ military ships, fishing and recreational boats, and thousands of commercial vessels, and the global costs of biofouling are astronomical. To combat this age-old scourge, Van Mooy has sought to unravel the complex biological factors that set the stage for marine organisms to settle and attach on surfaces in the first place, and then to survive and thrive on them. 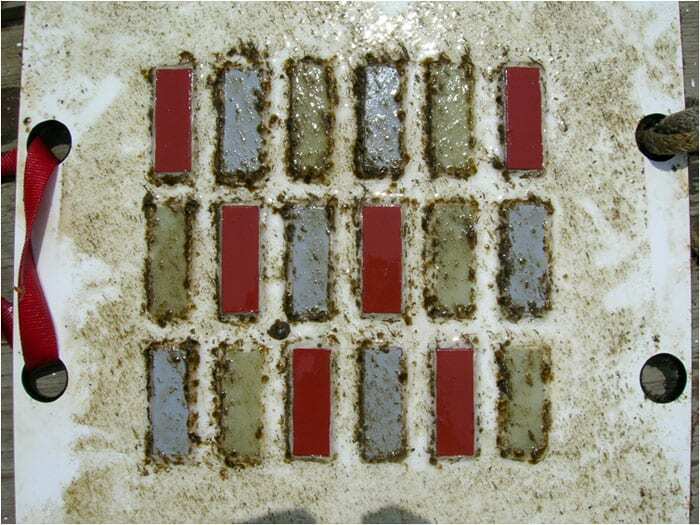 With this new approach, he is revealing strategic points where people can intercede to curtail the biofouling process. The immense problem starts at the microscopic level—with a slippery layer of marine bacteria that larger organisms attach to (and sometimes eat). “The slime” is a biofilm, a thin sheet of bacteria that stick to each other and to a matrix of molecules they exude to communicate with each other and to provide a hospitable environment for themselves. Once the slime forms, the rush is on, as algae and the larvae of creatures such as barnacles attach and begin to grow. 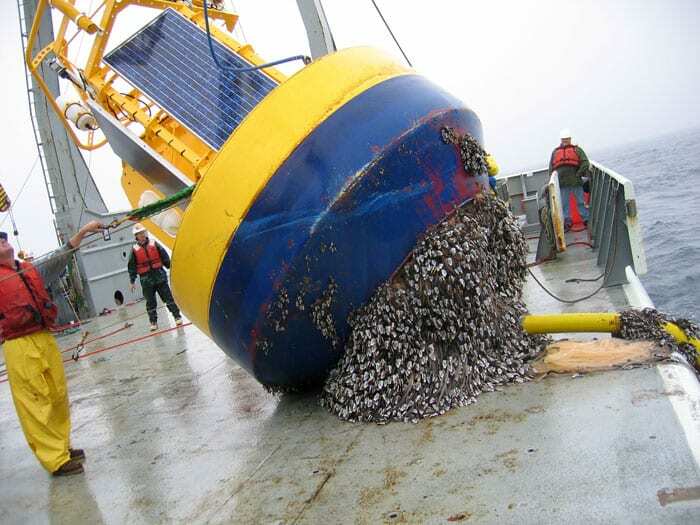 Routine scraping of an average size commercial vessel can yield up to 200 tons of organisms. And that’s just the fouling on the hulls. Of equal concern are the pipes, ranging up to about a foot in diameter, that move cold seawater throughout a ship’s heat-generating mechanical systems. 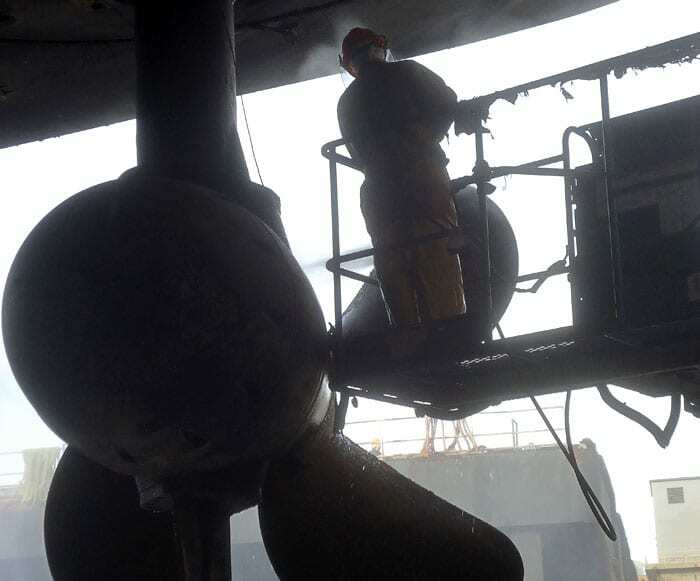 With the high costs of removing organisms from ships and the even higher costs of not removing them, inventors and ship operators have come up with hundreds of methods for reducing biofouling. Almost all of the would-be solutions have been variations on two themes: prevent organisms from sticking to the hull, or poison them if they do. In the era of wooden hulls, the primary threat came not from barnacles that attached to the outside of ships, but from marine worms—actually, long, thin, soft-bodied clams—that tunneled through the wood. 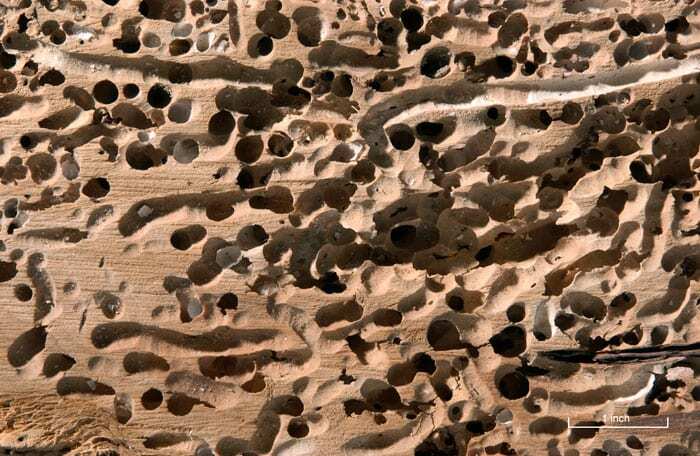 The Romans used lead sheeting to protect against shipworms, giving their ships an edge in commerce and in war. (It added substantial weight, but it was on the ships’ bottoms, contributing to the vessels’ stability.) 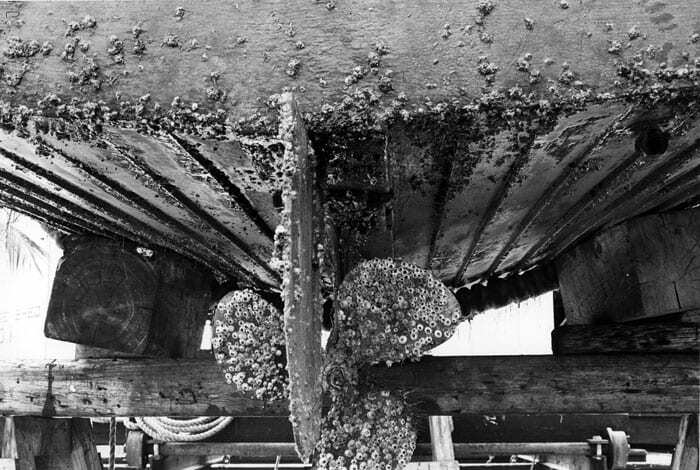 Lead-covered hulls still hosted barnacles that had to be scraped, but at least the wood remained strong. In the mid 1700s, the British began sheathing ship bottoms with copper, which repelled barnacles and other organisms and warded off wood-wasting worms. For a few decades, copper sheathing was all the rage; but when steel hulls came into use in the 1800s, copper could no longer be employed because it hastened corrosion of the steel. Steel alone was impervious to worms but susceptible to slime, algae, and barnacles. Once more, the hunt was on for a way to combat biofouling. The most popular solution, and the one still in use today: Paint. The success of copper sheathing prompted shipowners to try coating their hulls with paint containing copper. The idea was that small amounts of copper would leach into the water immediately next to the ship, poisoning any small creatures that approached. Several other toxic ingredients were also tried, including arsenic, mercury, strychnine, cyanide, and radioactive materials. A 1952 review of their performance by WHOI scientists indicated that some of the formulations worked well against barnacles. It did not mention what effects they had on the people who applied them. So tin-based paints were banned. 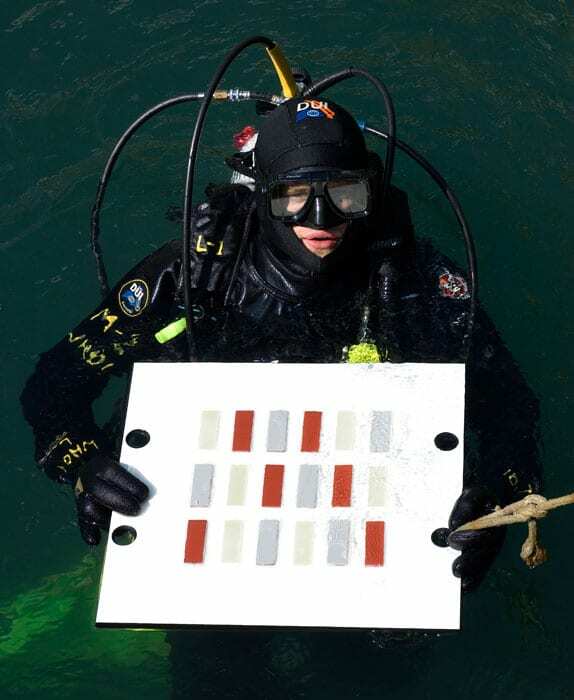 The U.S. Navy and WHOI now use the old standby, copper-based “antifouling” paint. But like tin paints, the very reason it works has become a matter of concern. 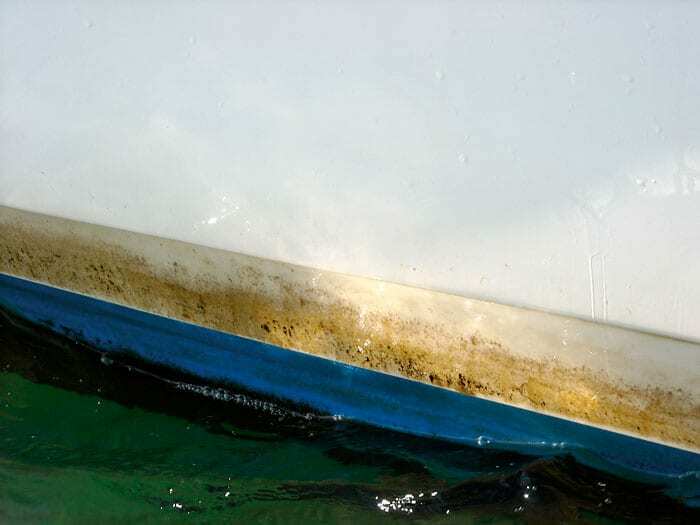 Recognizing the dangers of toxic coatings, paint developers have come up with slippery “fouling release” paints that defeat biofouling not by killing the organisms, but by making it impossible for them to stick to the ship. 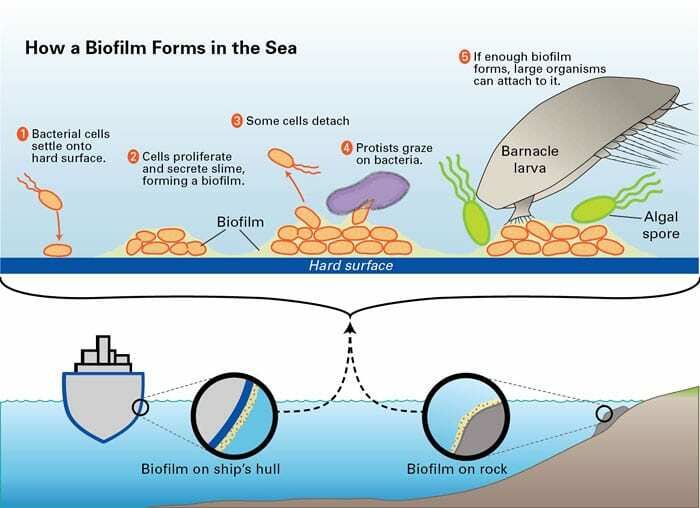 When a ship is in dock or moving slowly, microbes and larger organisms can attach to it; but when the ship moves quickly, the force of water moving past the hull knocks them off. That’s an effective approach for ships, such as commercial vessels, that go fast and spend most of their time on the move. But it’s much less useful for those that spend a lot of time in port or holding still at one site. “A lot of these ships that cruise at 25 to 30 knots love it,” said Wegman. “But with an oceanographic research ship, first of all, we’re slow going out”—top speed for WHOI vessels is 11 knots—“and then we stop at the study site. Some of our scientists’ favorite places to stop are these wonderfully productive places like the Sea of Cortez. Scientists love it, and we hate it, because the growth that goes on on our propellers and the piping inside the ship is significant. So the slippery stuff didn’t work for oceanography at all.” And it’s not a solution for the Navy, whose ships are in port about 80 percent of the time. Van Mooy studies microbial ecology in the ocean , and since forming biofilms is a fundamental way of life for marine microbes, he has been interested in the process for several years. 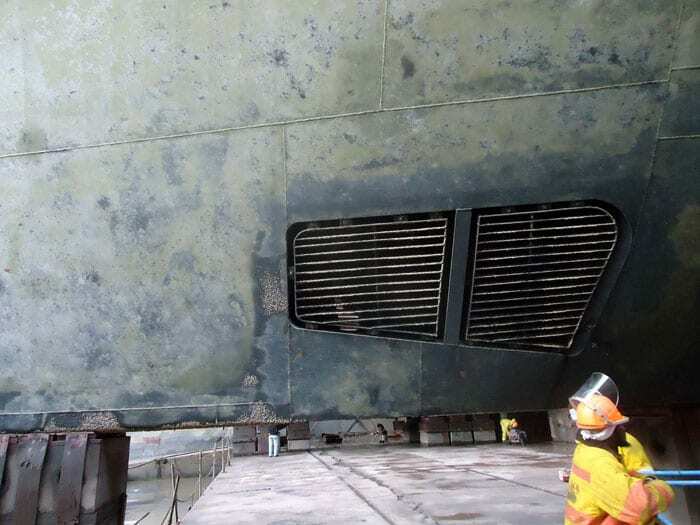 But he hadn’t made the connection to the fouling of ship hulls until the manager of the Navy’s program on biofouling research invited him to submit a research proposal to understand the process in more detail and identify steps that might be good targets for antifouling measures. Biofilms grow when cells settle onto the surface and proliferate once they are attached. These are the steps that have gotten the most attention in fouling prevention efforts. But microbial biofilms don’t just keep getting thicker and denser, said Van Mooy. Some of the bacteria detach from the biofilm and return to a free-floating existence, perhaps in search of a less-crowded surface to colonize. Many bacteria that do stay attached are harvested by grazing protists or other zooplankton. “This is very basic information that, surprisingly, is still just completely unknown” in the context of ship fouling, said Van Mooy. And that raised intriguing possibilities: Could boosting detachment or predation prevent biofouling? To measure all four key aspects of biofilm production—settlement, attachment, detachment, and predation—Van Mooy used metal plates about the size of standard notebook paper. He left some parts of the plates bare and coated others with antifouling treatments. Then he attached the plates to pylons just below the sea surface in Vineyard Sound. “I put them out in the environment and let real communities do their thing,” said Van Mooy. 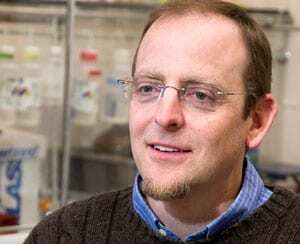 “Ninety percent of the research in this field is focused on doing culture work—you take a plate like this and you go into the lab and throw it in with your favorite bacteria”—lab-grown cells that are the microbial equivalents of white lab rats. That sort of experiment has little relationship to the actual situation faced by ships in the sea. He was determined to work with native microbes. He left the plates in the seawater long enough for a robust natural biofilm to develop. In winter, that took about two months and in summer, just a few days. Then he brought the slimy plates into the lab and put each one into narrow tanks made by technician Justin Ossolinski, each bathed by a continuous flow of 200 milliliters (a bit more than ¾ cup) of seawater. He then let the biofilms continue to grow for 24 hours, so he could observe them over one complete daily solar cycle. Some tanks received water fresh from Vineyard Sound, which contained other bacteria (that could settle onto the plate) and protists (that could eat biofilm cells). Other tanks received water that had been filtered to remove bacteria that might settle onto the plates and yet other tanks received water filtered to remove protists and thus eliminate predation on the bacteria. 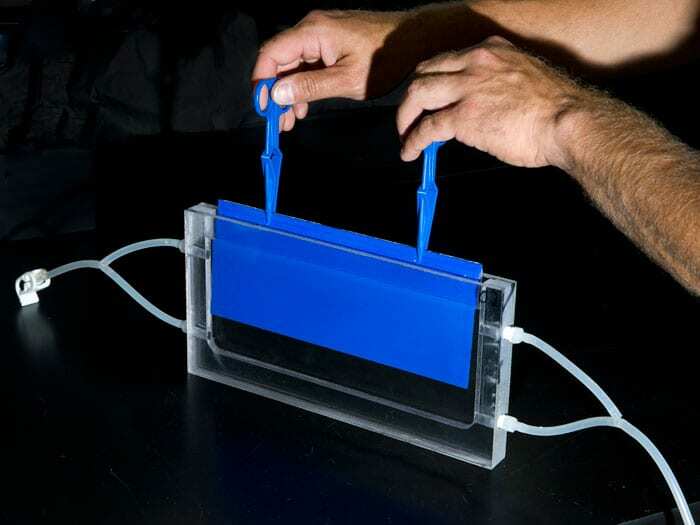 These experiments allowed Van Mooy to estimate how settlement, attachment, detachment, and predation contribute to biofilm accumulation—or, in some cases, hinder it. Van Mooy was pleased to find that his approach verified that copper-containing paints don’t stop microbes from settling, but the microbes die soon after they attach to the plate. The experiments also showed that accumulation of bacteria on a “fouling release” coating, which is not toxic, was almost 100 times faster than on the copper paint. Bacteria settled, proliferated, and formed a healthy biofilm on the slick coating because the water flowing past it was not moving fast enough to dislodge them. In winter, by contrast, “the rates are quite a bit lower, but there’s still some accumulation happening.” Grazing by zooplankton was so much lower in winter that the biofilm continued to grow, but slowly. Most exciting of all was how big a factor predation was. In both seasons, about two-thirds of the loss of cells was due to detachment and one-third to predation. Van Mooy’s experiments extend a long tradition of biofouling research at WHOI. In the years leading up to and during World War II, the Navy gave WHOI scientists a wealth of funding to work on biofouling. It was the first federally-sponsored research program at WHOI and the first effort anywhere to integrate basic research on the physics, chemistry, and biology of biofouling and its prevention. After the war, the Navy commended WHOI scientists for greatly advancing scientific knowledge of the fouling process and antifouling measures and saving it millions of dollars. Wegman, who has dealt with the practical aspects of biofouling throughout his 35-year WHOI career, only recently learned of Van Mooy’s work. He is especially intrigued by the possibility that tiny predators could become allies in the never-ending battle against fouling organisms. This research is sponsored by the Office of Naval Research. Do Microplastics in the Ocean Affect Scallops?